Say what you will about Chinese motorcycles; in most cases the MO team would probably agree with you. When your core market is the Asian continent simply looking for cheap transportation, as a manufacturer you stamp out cheap motorcycles by the truckful to meet the demand. Transport nearly any of those motorcycles to the U.S. – where the expectations are entirely different from the Asian market – and we’re going to be severely let down. Moral of the story: a cheap bike is a cheap bike. The mistake, however, is assuming every Chinese motorcycle is junk. 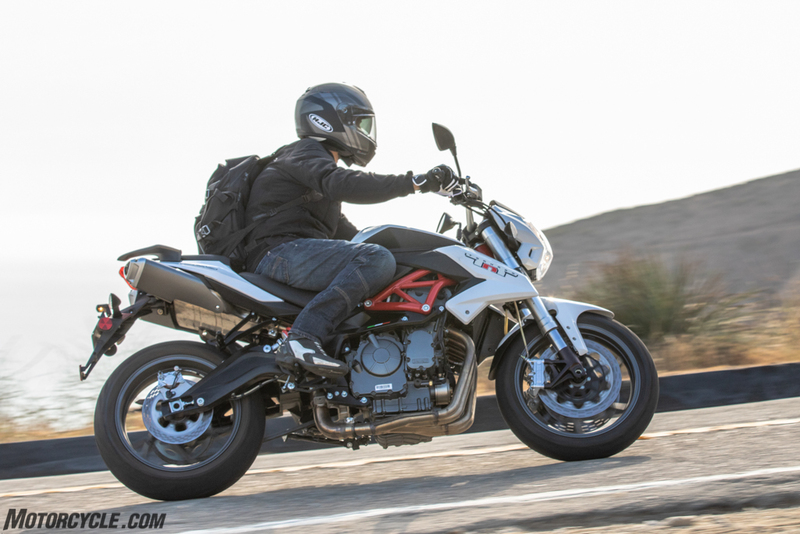 Enter the Benelli TnT300 and its bigger sibling, the TnT600. Benelli is likely a name most moto junkies are familiar with, as the Italian marque has a storied history dating back to 1911. Today, Benelli is under Chinese ownership from the Qianjian Group, with design still taking place in Italy and production occurring in China. The TnT300 (right) and TnT600 proudly wear the “Made in China” badge. 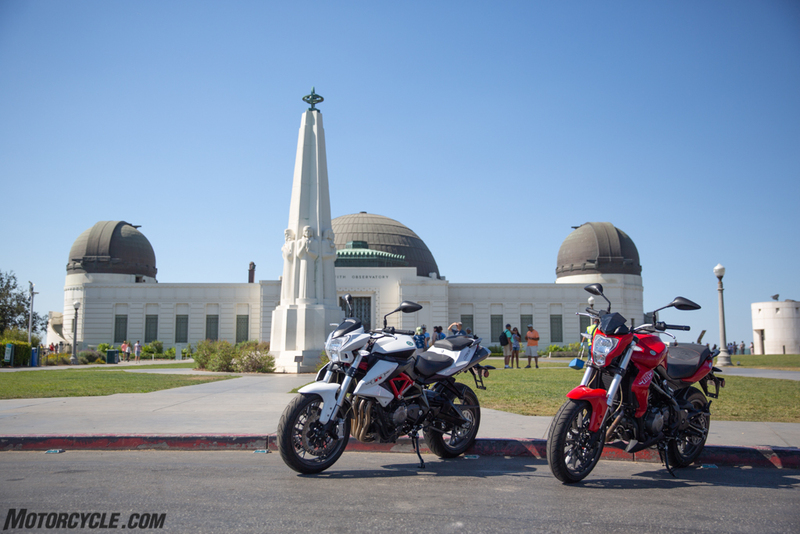 SSR Motorsports, importer of Benelli Motorcycles and its own self-labled motorcycles (which have their own contingent of knock-offs in other markets), has been bringing motorcycles into the United States since 2002. Dirtbikes were the original offerings, but the company is expanding its portfolio with street motorcycles. Motorcycle.com has reviewed several of these models already, including the TnT300 and TnT600, but during a recent press ride, SSR/Benelli wanted to remind folks what each model was all about. A word Michael Lee, Benelli’s marketing manager likes to use is “outlier.” As in, Benelli (and SSR by extension) are placing themselves as outliers in the respective markets its models compete in. In the case of the TnT300, the 282cc parallel-Twin distances itself from the small displacement competition in a few ways. First off, it’s the only model in the class with a 360-degree firing order, meaning one cylinder fires after each complete revolution of the crank. The result is a cool, raspy exhaust note unlike anything else in class. Its claimed 32.2 hp (we haven’t had a chance to put one on our own dyno) and 18.4 lb-ft. puts it near the top when compared to similarly-sized competitors in class like the Honda CB300R and BMW G310R, but when stacked against slightly larger motorcycles like the 373cc KTM 390 Duke, it feels a little outgunned. The most significant way the TnT300 stands out, however, is its $3,999 price tag. Less expensive than all the models listed above and others like the Suzuki GW 250 ($4,099), GSX250R ($4,499), and Honda Rebel 300 ($4,449), the TnT300 looks even more attractive now that Benelli is offering a $300 rebate on top of its class-leading price. The TnT300 is a surprisingly fun motorcycle to toss around in corners. An upgrade in rubber would go a long way in upping the fun factor. Though you can’t argue with the name “Cordial” on the sidewall. Short of repeating everything John Burns spouted when he reviewed the TnT300, I’ll go ahead and point out some of its high and low points. The first thing you notice about the 300 is it’s a physically larger motorcycle than its competition. Lee tells us this is because the 300 is intended for larger physiques, but in the case of the 300, it fits regular-sized adults very well whereas the other models in this class can be considered toy-like for anyone over 5-foot-7. Springing the switchblade key open (a gimmicky-yet-cool feature) and bringing the 300 to life exposes the rider to the surprisingly raspy exhaust note. 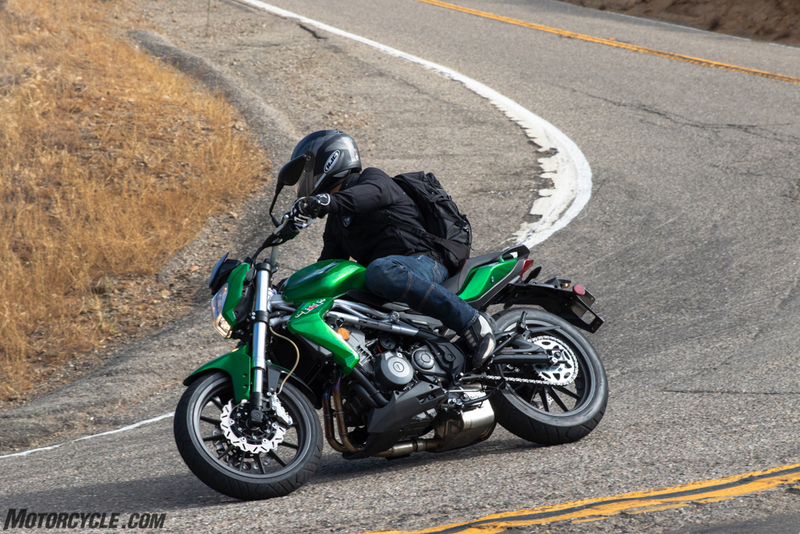 The clutch pull is a little stiffer than a lot of other bikes in the class, but it scoots along surprisingly well for such a little engine – just be sure to keep the revs between 6,000 and its 11,000 rpm redline. You’ll want to do this anyway as the baby TnT sounds really good wound out like this, even with the stock exhaust. Despite the huge under engine collector necessary for EPA reasons, the TnT300 still has an intoxicating exhaust note. Something as simple as a slip-on exhaust would make it sound even better. Note also the twin, 296mm wave rotors up front. While they look cool, stopping power is decent at best. Steel-braided brake lines and four-piston calipers are a nice touch, but the twin 296mm wave rotors are a tad small and get overworked when you really start pushing the bike. On the handling front, an inverted fork is a plus for this price and having rebound adjustability at both ends is also a surprise. Nicely spaced bars give decent leverage, but the bias-ply Cordial tires (yes, the tire name is Cordial) aren’t the most communicative. As a general commuting machine, however, the TnT300 is quite impressive. Ergonomics feel comfortable, and the little bikini fairing pokes just a big enough hole in the air to divert a decent amount of wind away from your chest at highway speeds. All things considered, the TnT300 is the one I prefer between it and the 600. Read on to see why. Visually, the aesthetics of the TnT600 have largely withstood the test of time. It’s an attractive motorcycle in the middleweight naked bike category, with its trellis frame and sharp angles. Though the main styling component clearly showing its age is the undertail pipes. They harken back to 2006 and a time when undertail exhausts were all the rage. Coincidentally, this was about the time the big TnT was announced. 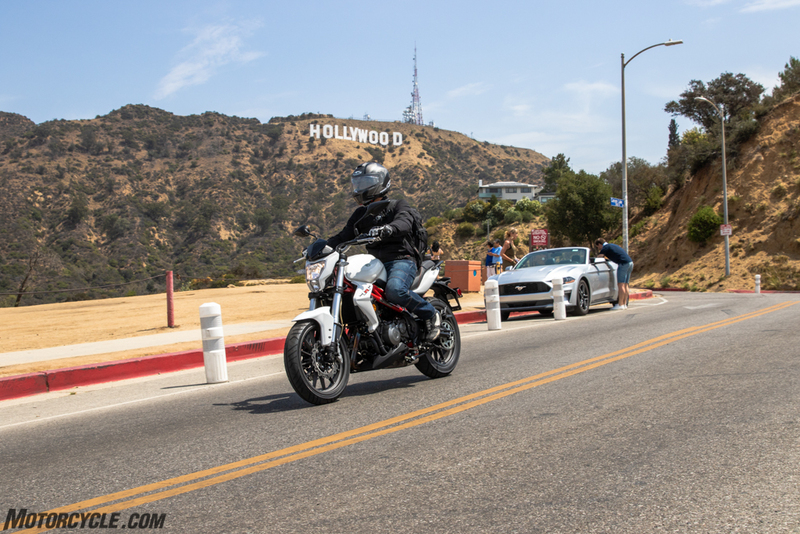 Like the TnT300, if you want the full scoop on the 600, check out Tom Roderick’s review here. Looking at the TnT600 in pictures is one thing. In person, the 600 looks large and in charge. Like the 300, the bigger brother is physically larger than the competition. This was fine for the 300, as the added girth made the bike feel like a “real” motorcycle. 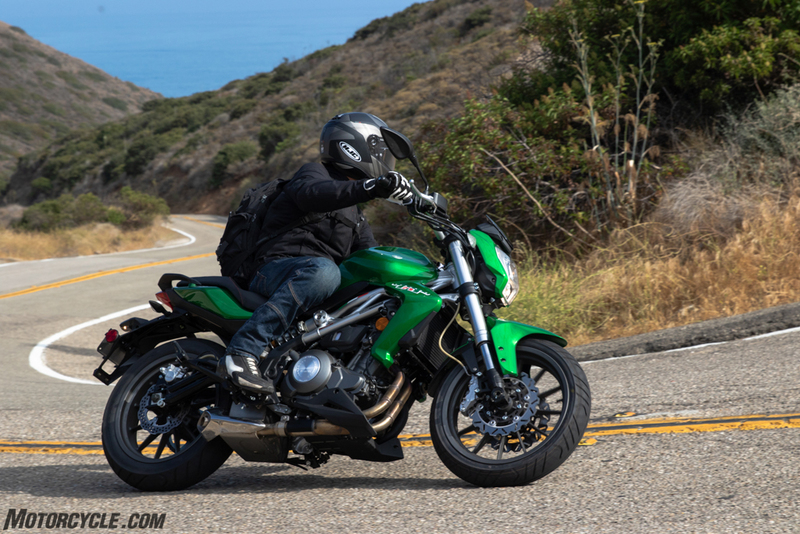 When you sit on the 600, its wide fuel tank makes it look like it has love handles – that is, once you muscle the hefty 509-pound (claimed) motorcycle off the sidestand in the first place. From there, the wide tank is met with pegs that are a tad on the high side, making for a slightly awkward riding position. To put it in plain English, the 600 is a big motorcycle. As the name implies, forward thrust for the bigger TnT comes from a 600cc inline-Four making 70.4 hp and 34.4 lb-ft of torque when we last had one on the dyno in our 2017 Naked Middleweight Shootout. The horsepower number is decent for the category, but it comes at a stratospheric 11,400 rpm. The torque is a bit anemic in class, too. Making matters worse, when you look at the dyno chart the TnT600’s fueling is all over the map – with a huge drop off between 5,000 rpm – 7,000 rpm. Meanwhile, others in its class like the Kawasaki Z650, Suzuki SV650, and Yamaha MT-07 feel more lively, sporty, and responsive, with corresponding dyno charts. This view gives a good look at the steel trellis frame. Below it is a cast aluminum lower frame. Together, the two cradle the wide four cylinder engine and dial in just the amount of chassis flex the Benelli engineers wanted. The 600 benefits from a 50mm inverted fork, which does help give the front end a feeling of stiffness the other bikes don’t quite match, but the extra heft the TnT carries practically negates that advantage. Stopping power is fairly good; two 320mm discs up front get paired with radial-mount four-piston calipers for pretty decent stopping power. But again, you also feel the extra weight when stomping on the stoppers. If it’s not obvious by now, the other bikes in this category have a leg up on the Benelli for one simple reason: less weight. Up to 112 lbs lighter in the Yamaha’s case. 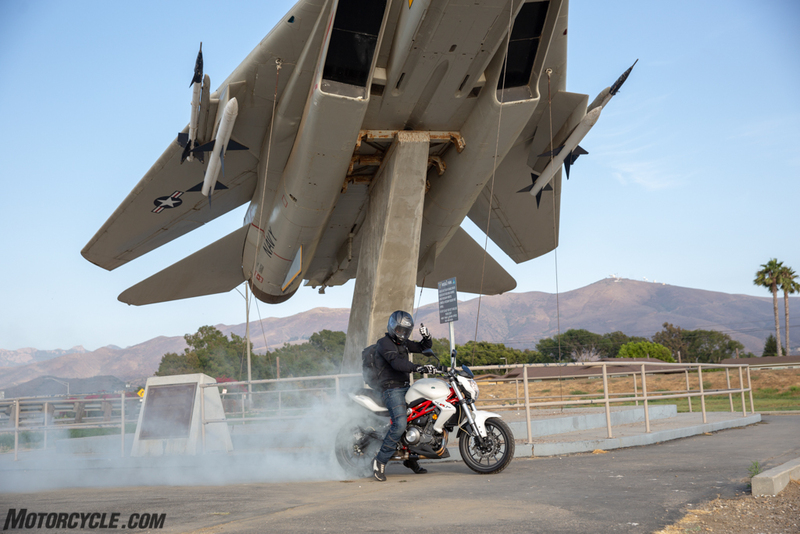 Couple that with more power and torque, and the TnT600 is hard to defend. However, we need to go back to Lee’s catchphrase: Outlier. While Lee didn’t admit to the same pitfalls for the 600 as mentioned here, he did admit to its $6,999 price tag giving it no advantage in the marketplace. For 2018, the TnT600 sees a significant price drop from $6,999 to $5,999. Dropping the price a thousand bucks puts it well clear of the $6,999 Kawasaki, $7,049 Suzuki, and $7,599 Yamaha. In fact, it even drops it below the $6,099 Honda CB500F. With its reduced price, suddenly the TnT600 makes you stop and think about which financial choice to make between it and its similarly-priced rivals. If cost is your biggest deciding factor, then the 600 poses a great value for performance. That is, if you don’t mind its extra weight and girth. 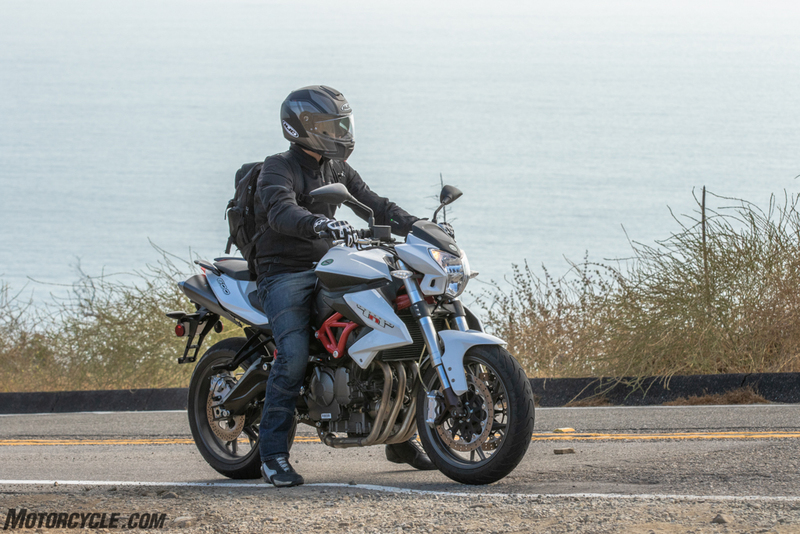 Personally, since Benelli’s own research indicates models in the 600’s class are at least partially financed, I’d opt for either the Z650, SV650, or MT-07; the extra cost isn’t much when spread over the life of a loan. 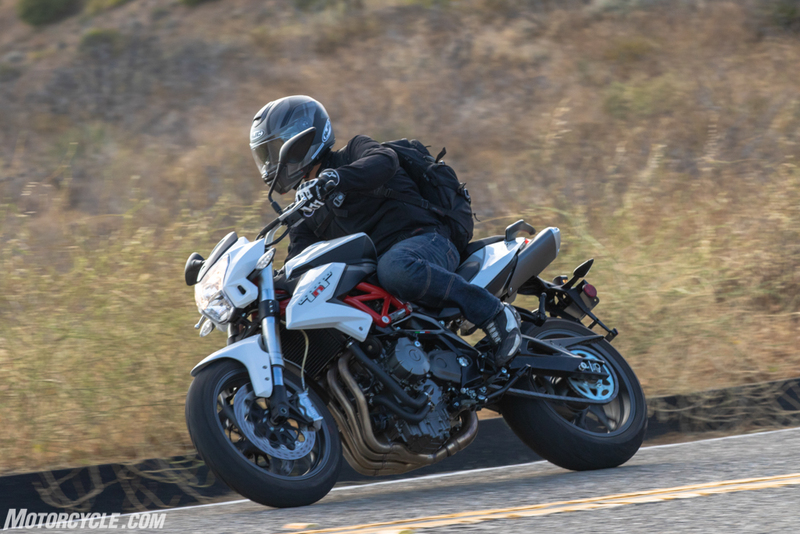 Alternatively, you can opt for the TnT300 at $3,999 – a price range Benelli says consumers typically purchase outright without financing – and have a motorcycle that’s more entertaining than the 600 without a payment every month. In the end, the TnT300 makes a stronger case for the best bang-for-the-buck between it and the TnT600. But with such strong competition in both categories, neither is the one we’d ultimately park in our garages. Previous « Church of MO: Sport Tour 2006!